Pastels and frills just don’t cut it. You want something rich and sophisticated. You want cherry. Cherry cribs are a chic choice for the nursery. 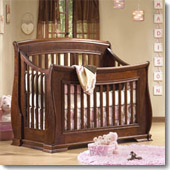 And not only stylish, cherry’s warm undertones will mark your nursery as friendly and inviting.